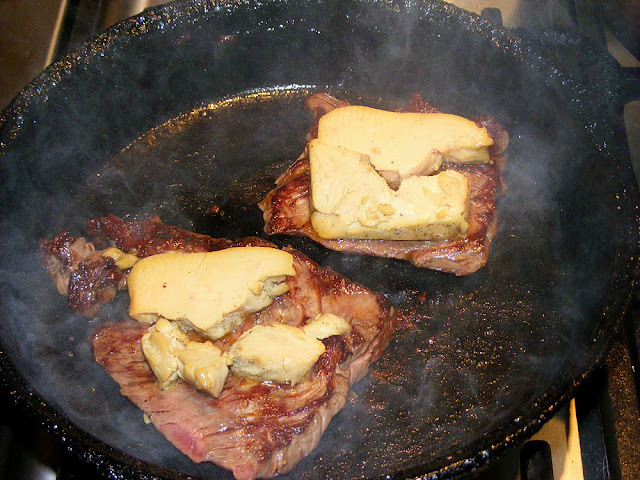 One of our favourite winter holiday season meals is French style steak topped with our homemade foie gras. 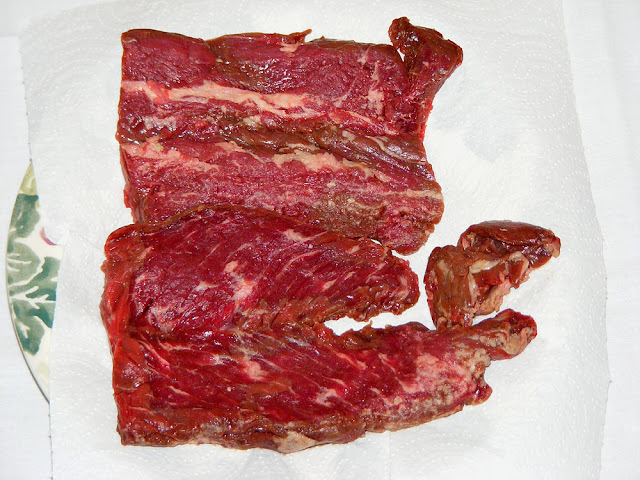 Get your butcher to butterfly some hanger steak (the cut is called onglet in French and cut following the grain, not across it like rump or fillet) so it is fairly thin. This is a very popular cut in France, considered tasty but requiring some care to cook well. Pat the steak dry with paper towel. Massage a little oil into the steak so it is lightly coated. Season the steak with salt and pepper, then set aside to cure for a bit (until it is room temperature). Heat a cast iron pan until smoking. Place the steak in the pan and sear for one minute. Turn the steak and top with the foie gras. Cook for one minute further. Serves 2. Hanger must be cooked very rapidly at a high temperature. It overcooks easily and dries out because it does not have a high fat content. Cooked this way it retains all its flavour, tenderness and juiciness. Overcooked it becomes tough, stringy and flavourless. 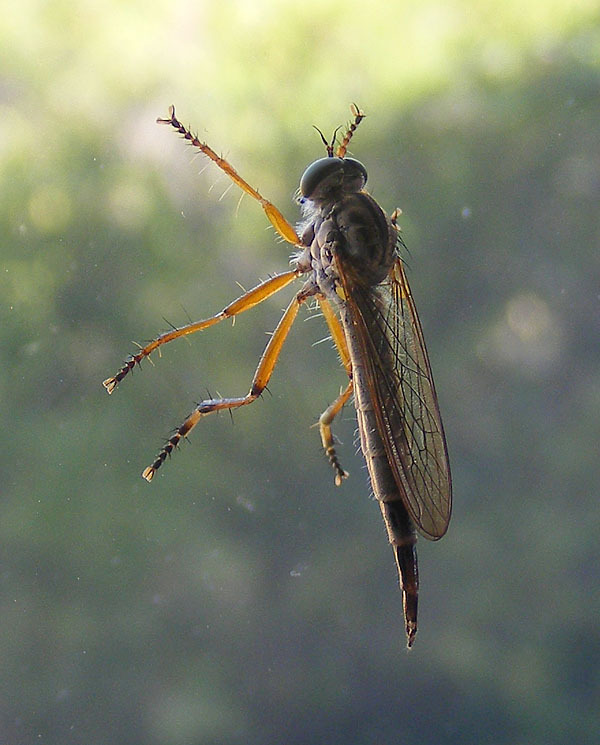 This is a female robber fly that I photographed on a sliding glass door in Canberra. I think it's Cerdistus sp, but the females of this genus are very difficult to tell apart, so I will never identify it to species level. I've contacted my robber fly guru, Reinoud van den Broek, the Dutch specialist in Asilidae (robber fly family) but I'm not holding out much hope that he will be able to identify it from a photo. Cerdistus are 'classic' robber flies. They belong to the largest, most typical and most difficult subfamily Asilinae. Members of the Cerdistus genus occur in Europe, North Africa and Australia that I am aware of. Robber flies are highly efficient hunters, preying on other flying insects and sometimes spiders. They possess stabbing mouthparts that can deliver a toxin to immobilise their prey. They do not attack humans although in the unlikely event you could catch one in your hands they are capable of piercing skin. The toxin they can deliver has no effect on humans. For such large and widespread flies there is remarkably little known about their life cycles. 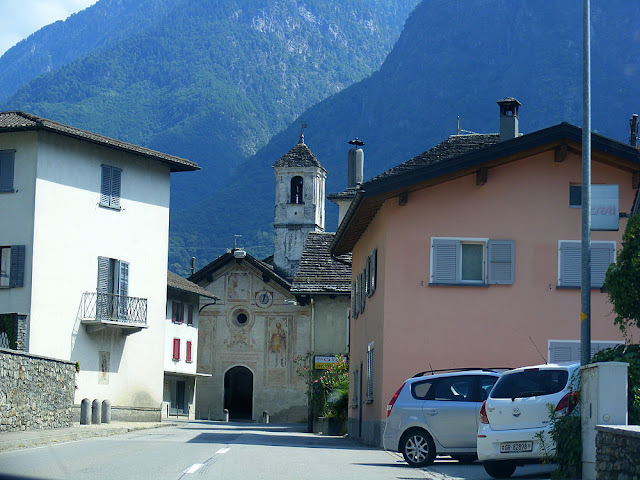 Entering the village of Grono. On our way home from Switzerland we came over the Alps and ended up in Grono at lunchtime. The first restaurant we encountered looked like our style so we stopped. The menu of the day was veal chops, which we were happy to eat, followed by icecream. 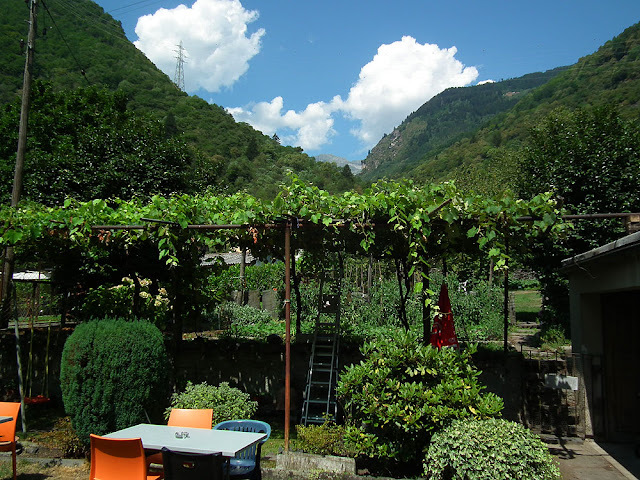 Grono is in the Italian speaking area of Switzerland, but what I didn't expect was that our charming young waitress only spoke Italian -- no English, no French, no German. My Italian is extremely rudimentary, but we got on OK and had a good cheap lunch. It further turned out that there was a much smarter restaurant with a vine covered terrace out the front further along in the village, but we were happy with our choice and undoubtedly got away with a much cheaper lunch than the other restaurant offered. 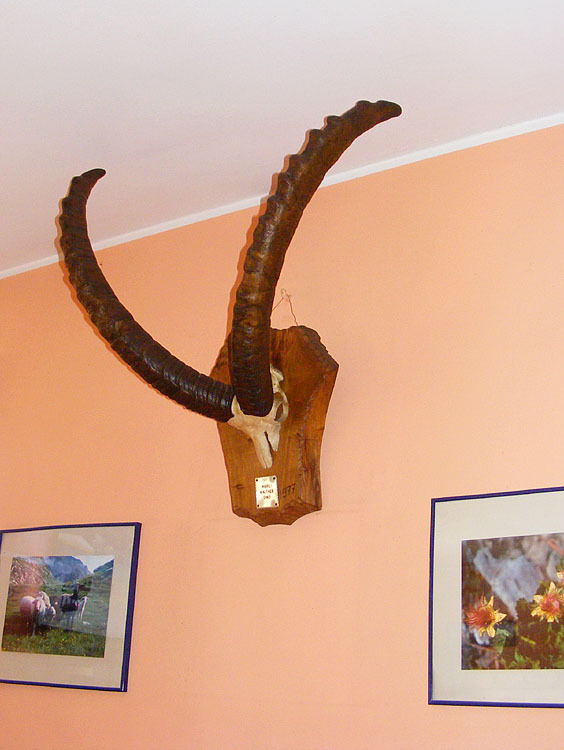 Restaurant decor, including Alpine Ibex hunting trophy (not antique, but from 1977!). For another interior view, see Simon's post about the cagnomatic. The Hotel Restaurant Calancasca, with our lovely waitress in black (standing, centre). 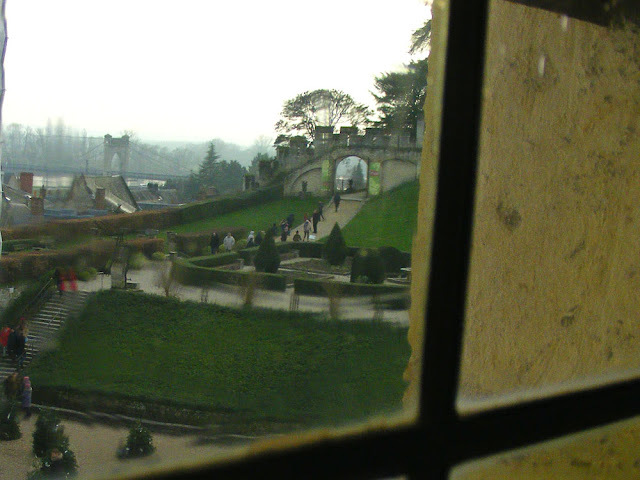 The terrace out the back of the hotel. On Boxing Day, which is not a thing in France, Simon and I, along with our medieval historian friends Niall and Antoinette, paid a visit to the chateau of Langeais. 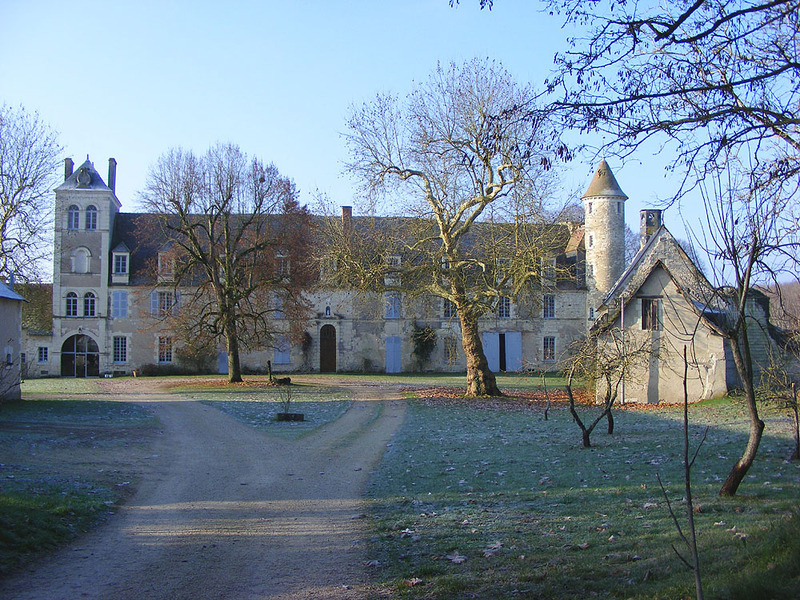 It is a late medieval gem, quite sympathetically restored in the 19th century and this Christmas, participating in the 'Christmas in Chateaux Country' programme. 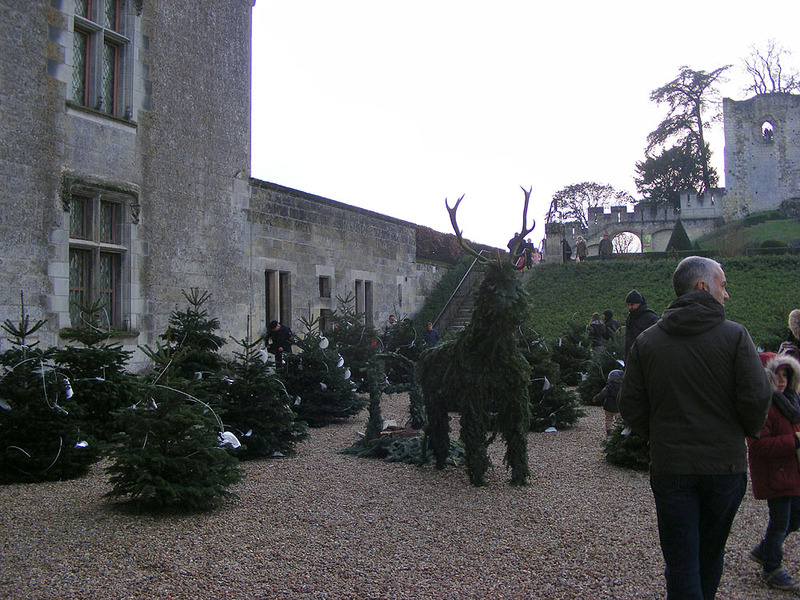 Despite the frigidity of the weather, there was a reasonable number of visitors at the chateau. 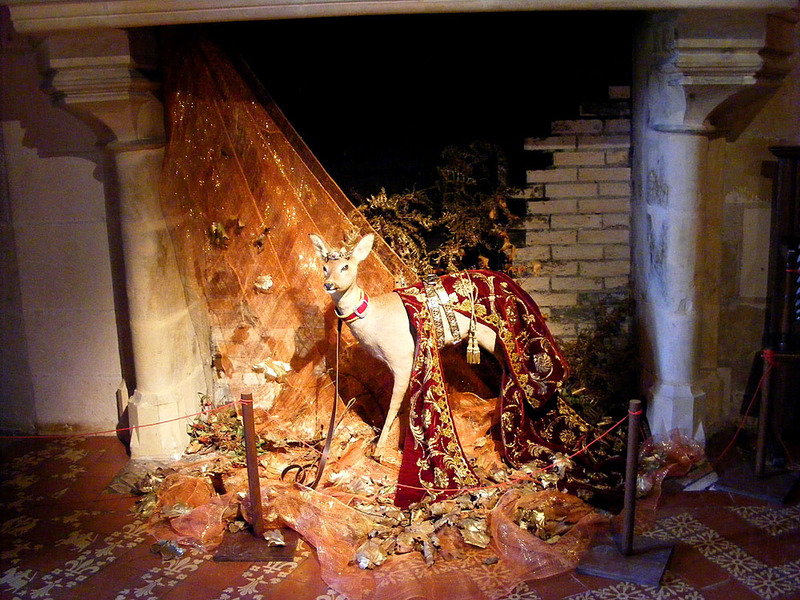 I was particularly impressed with the medieval feel of the decorations, both inside and in the courtyard. 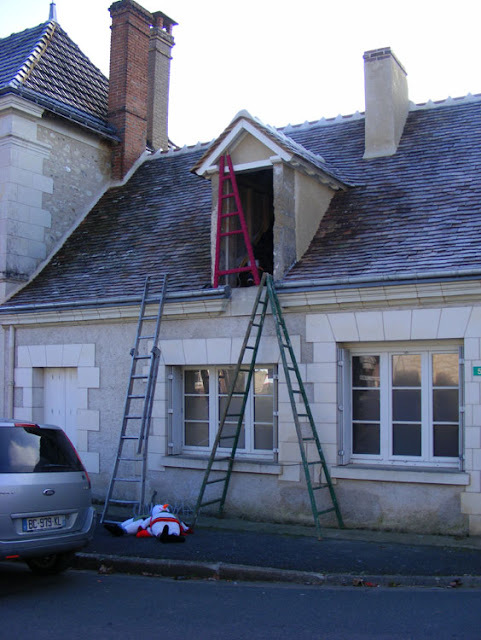 The roof and exterior stonework is being cleaned. You can see how far they've got. 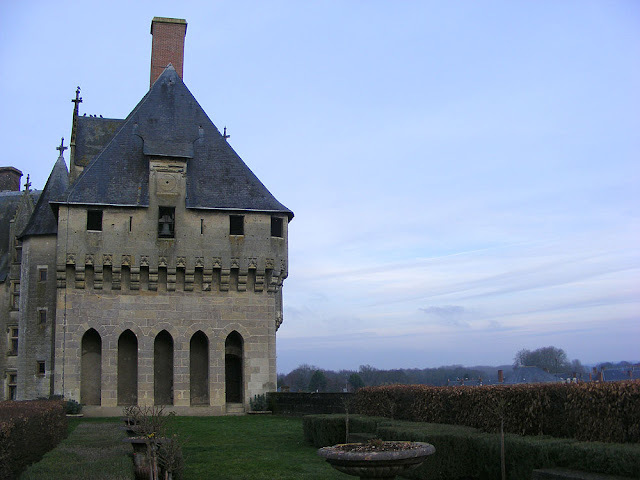 The front entrance to the chateau. 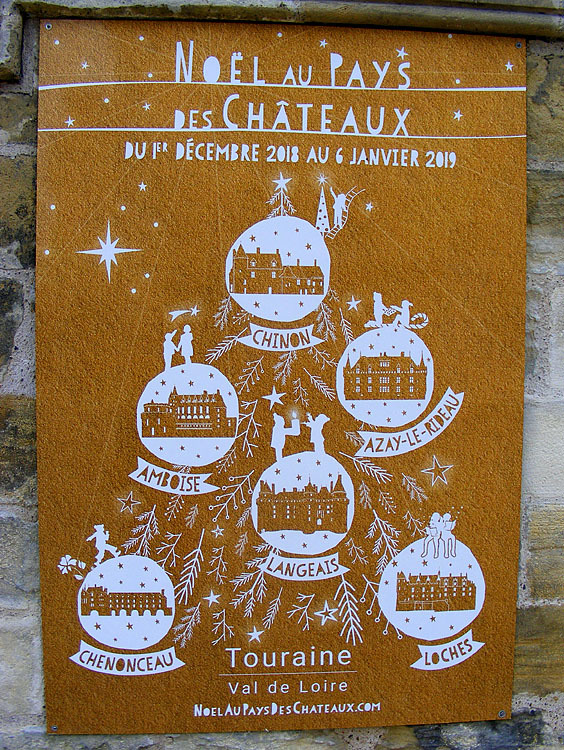 Visit these six chateaux before 6 January to see their spectacular Christmas decorations. A view of the famous suspension bridge across the Loire from inside the chateau. 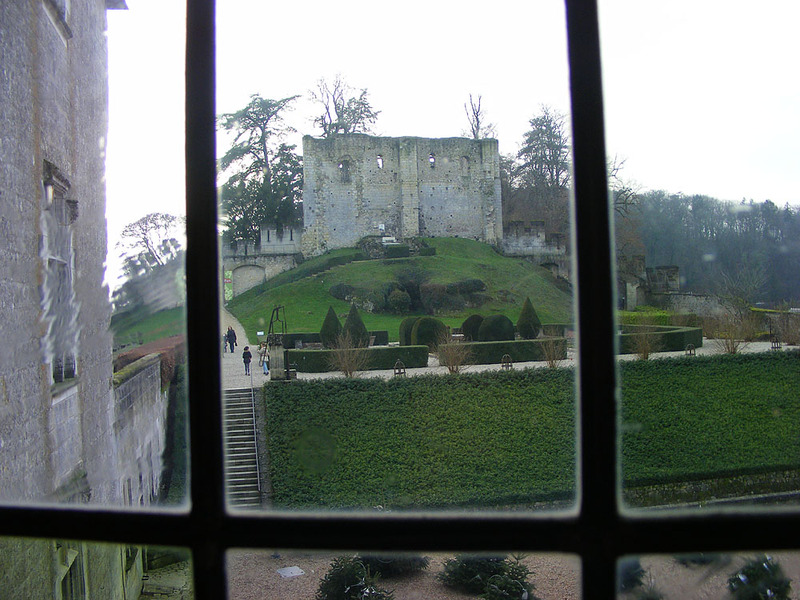 View of the 10th century motte and bailey built by Fulke Nerra, from the 15th century chateau. Reindeer and sleigh made from yew and red deer antlers. 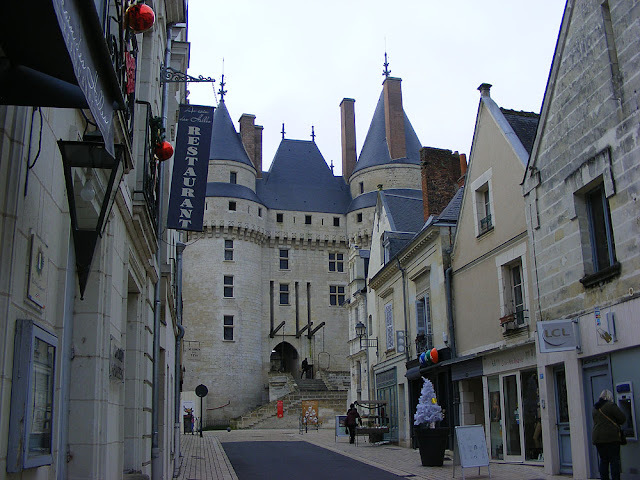 The western end of the Chateau of Langeais. 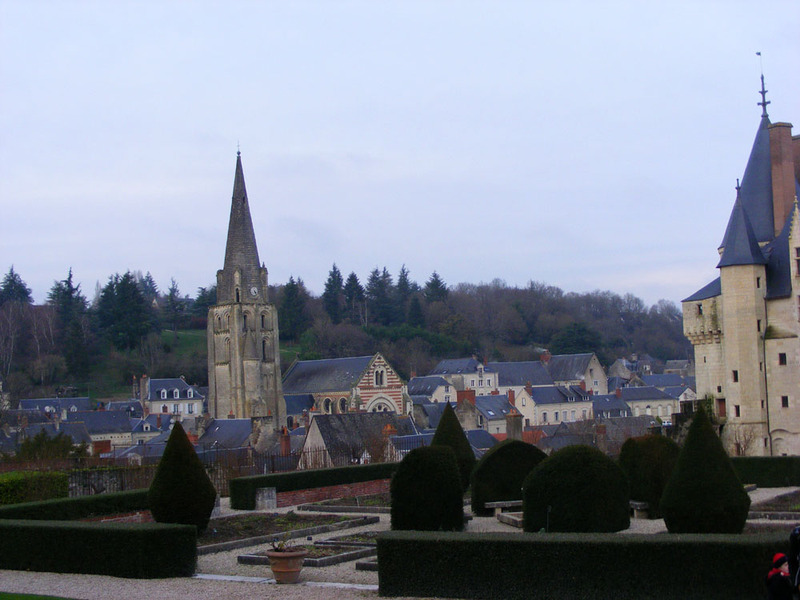 A view over the town from the grounds of the Chateau of Langeais. 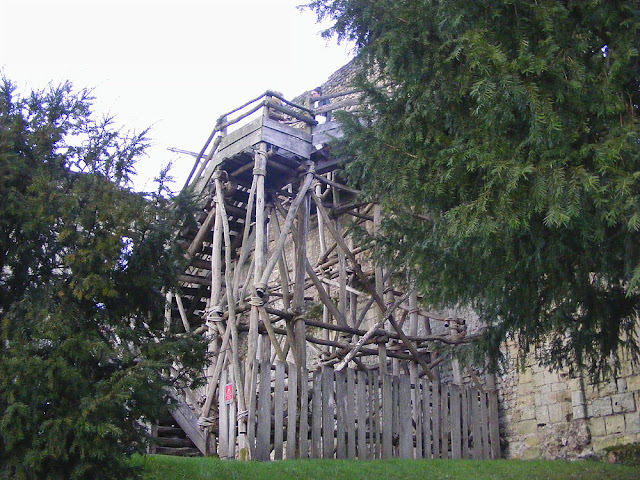 Reconstruction of medieval scaffolding on the ruined tower at Langeais. 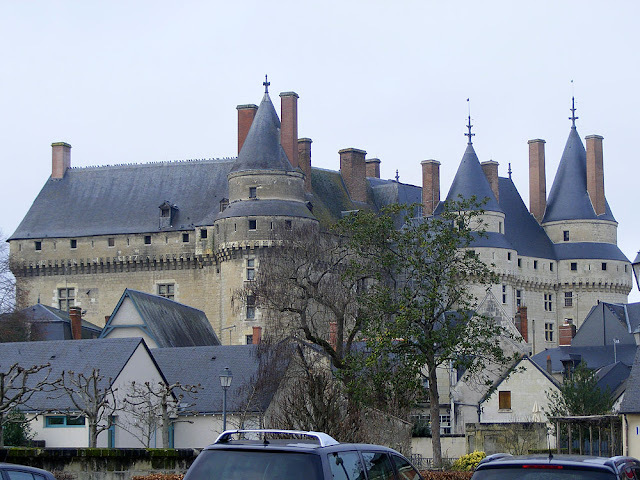 Here is a previous post about the Chateau of Langeais, with a bit more history and detail. You've got until 6 January to visit the six chateaux participating in the Noël au Pays des Chateaux programme. Trust me, the splendid decorations are worth seeing. 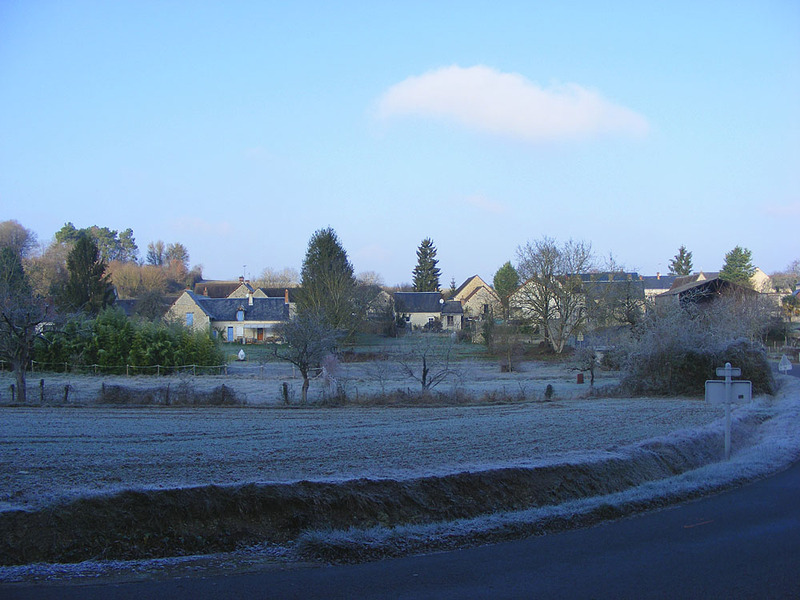 We had a properly cold snap in mid-December for a couple of days. These photos were taken at Bossay sur Claise and the nearby Chateau of Cingé at about 10:30 one morning. Everything was frosted and stayed that way for the whole day, with the temperature never getting above -1C I'm told. 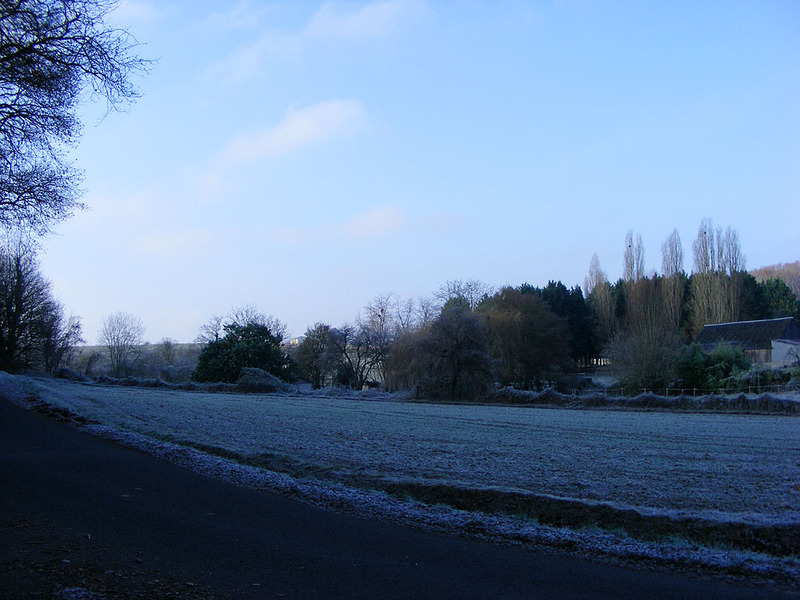 The next day there was some drizzle which froze on the ground, making roads and footpaths treacherous. 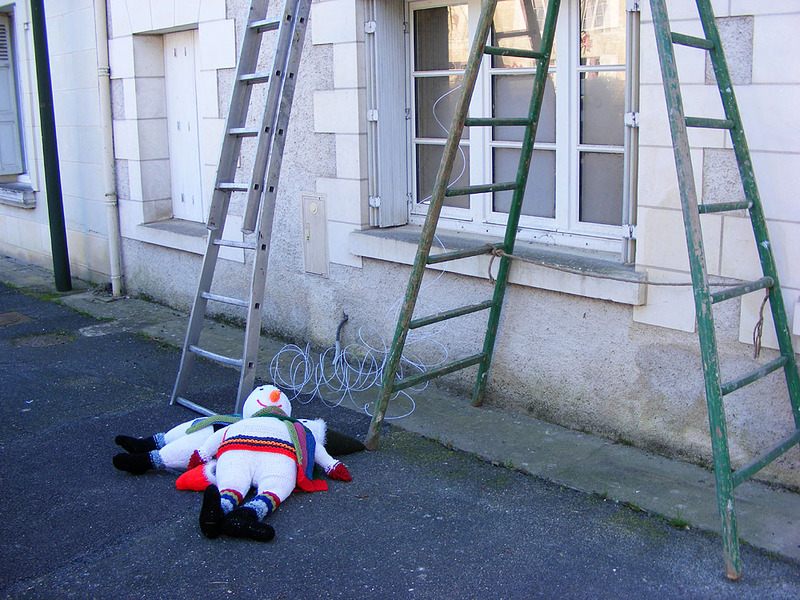 I slipped and slid my way round the market and heard that several people had fallen in the street. 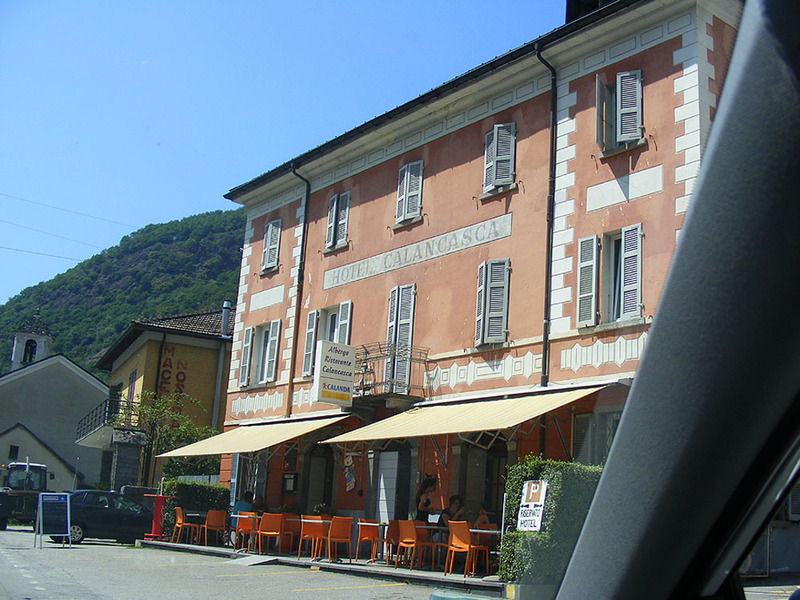 A couple of people drove up to the boulangerie and shouted their orders from the car rather than risk getting out. A brave soul emerged from the shop and handed over baguettes as required. 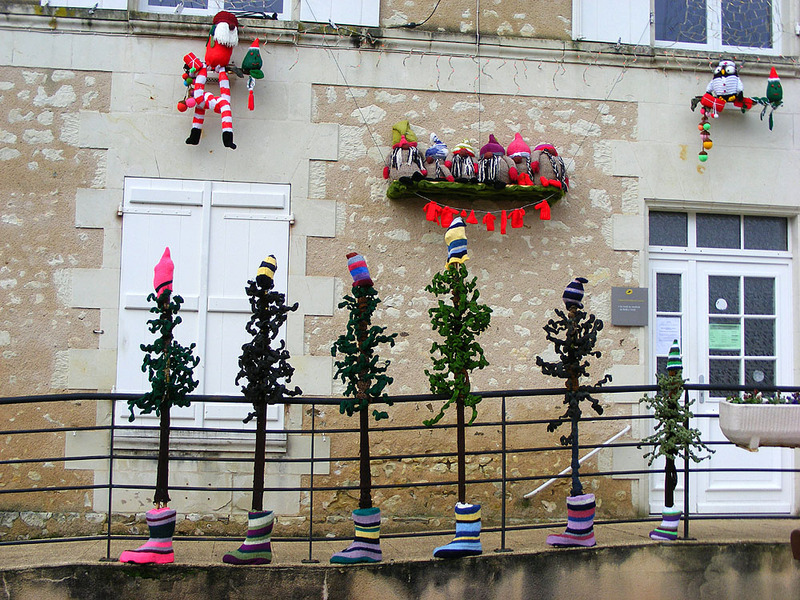 I drove through Bossay sur Claise, the village just upstream from us, about ten days before Christmas and noticed that their municipal Christmas decorations all appeared to be knitted. I was intrigued so stopped to take some photos. I was not the only one -- the photographer for the Renaissance Lochoise was expected any moment and Christian Caillet, our local stringer for La Nouvelle République, was already there. The municipal workers were busy attaching knitted characters large and small to buildings and trees in the square. 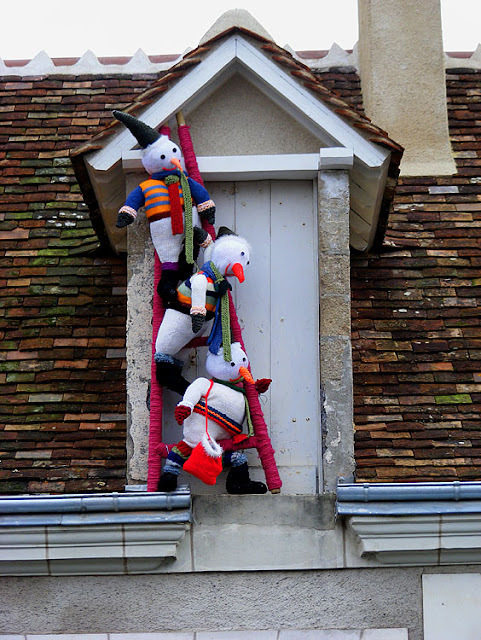 The workman dealing with these snowmen was just knocking on the door of the private residence where they were to be placed when I arrived. 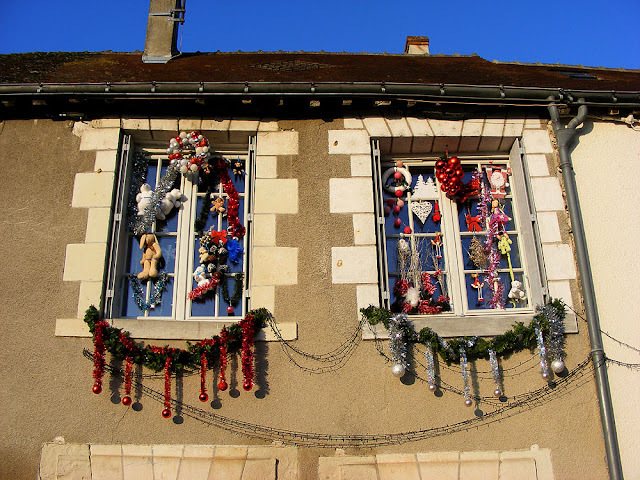 It turns out that the knitting of Christmas decorations was a community project. Every Wednesday since the end of August a group of volunteers has got together. They unravelled old jumpers to get yarn. Other useful accessories, such as old tennis balls were left at the town hall by donors. Everyone, from children to the elderly, were encouraged to participate. An skilled stitcher and yarn crafter was on hand to provide advice and tuition. The aim was to create a project that was environmentally friendly, sharing and fun. The knitters, crocheters and stitchers made something of worth by reusing stuff that would otherwise be thrown out; they reinforced social links, especially for those living on their own; and developed participants creativity. It all came about because the year before Bossay had done a similar project to create costumes for the Grand Parade at the Agricultural Show. The woman behind both projects, Danièle Déletang, is a retired professional decorator. She lives in Bossay, but travels often and widely. Having encountered a town in Western Australia that had decorated its trees for Christmas Eve she figured she could organise something similar at home. It fitted in nicely with Bossay's history too, as every year they hold a wool fair in June. The decorations will be in place until Epiphany. A charmingly decorated house in Preuilly. We wish all our readers a merry and loving Christmas. To the east of us, on the flat plains of Berry, they grow a lot of lentils. We like lentils a lot, so it's a perfect arrangement. 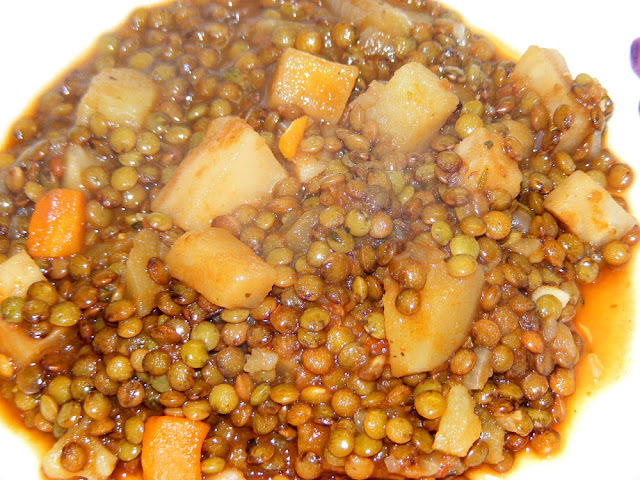 One of my local market stallholders sells Berry lentils and another sells organic vegetables. 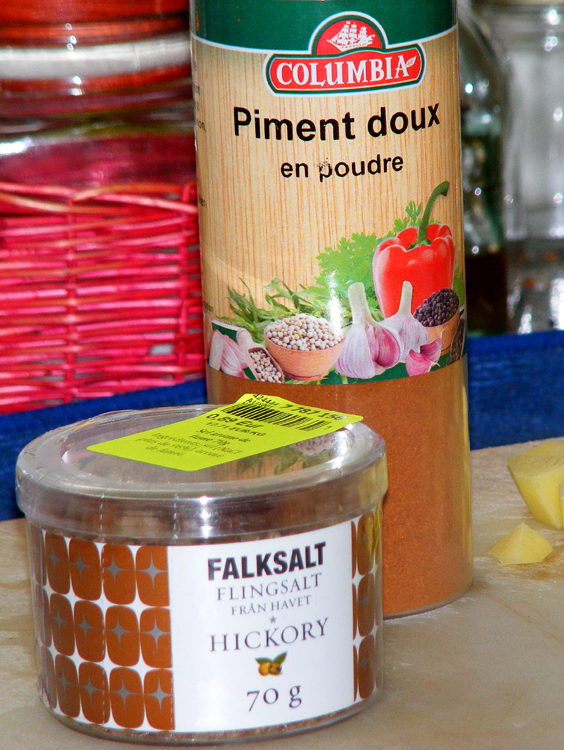 The smoked salt which gives the recipe its distinctive seasoning I picked up at Noz. Heat the oil in a stock pot, add the pinch of salt and sweat the onion, carrot, swede and celeriac for 10 minutes. Add the potato and garlic and sweat a couple of more minutes. Add the lentils, paprika, smoked salt, herbs and stock. Add the tomato paste and lemon juice and cook for 5 more minutes. Serve in bowls with a green side salad and buttered baguette. Serves 7 (407 calories per serve). Smoked salt and sweet paprika. I think this large hairy spider is the huntsman Holconia flavida, but the family is not easy to identify to species level. 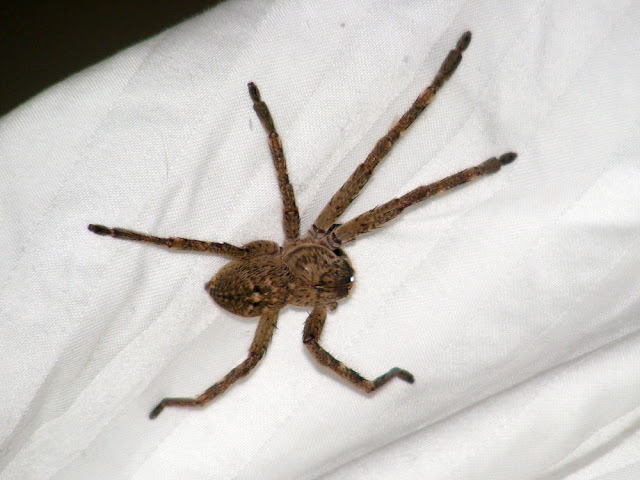 Huntsman spiders of various species are very common all over Australia, living in the bush under bark, but also co-habiting with humans in their houses and sheds. They aren't usually agressive, but can bite if threatened. Huntsman spiders kill their prey with venom, but are not considered dangerous to humans. 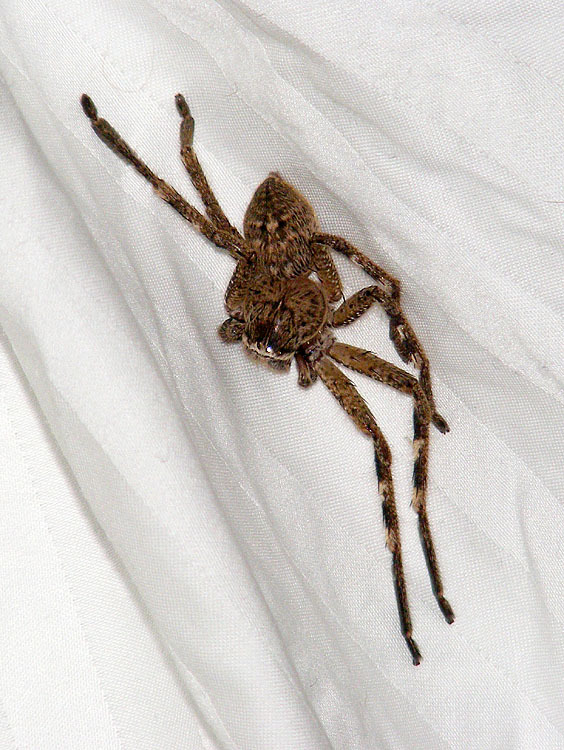 They are the largest spiders in Australia and can measure 16cm from toe tip to toe tip. Huntsman spiders can run really fast, across floors, up walls and across ceilings, which makes them somewhat alarming even when you are used to them. This one might have been a bit hampered by having lost two legs on one side, but I never saw it move so can't confirm that. 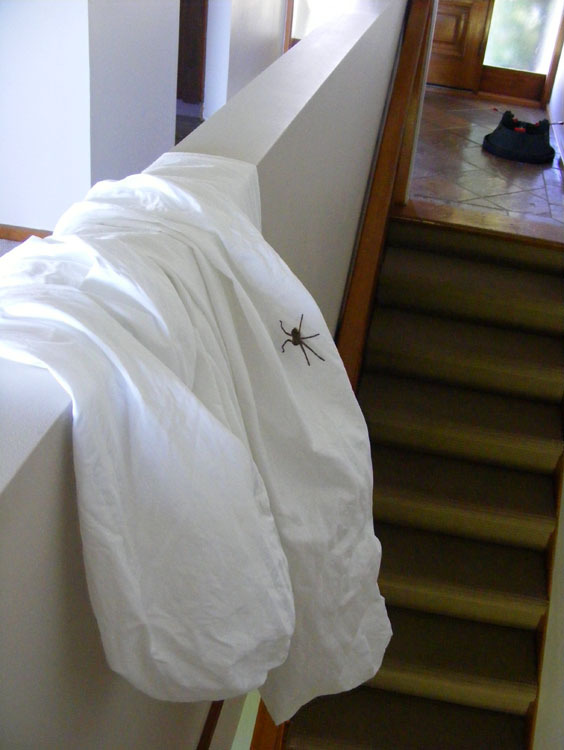 It spent several hours sitting on this sheet unmoving, probably worried about being seen in broad daylight. These photos aren't very good. 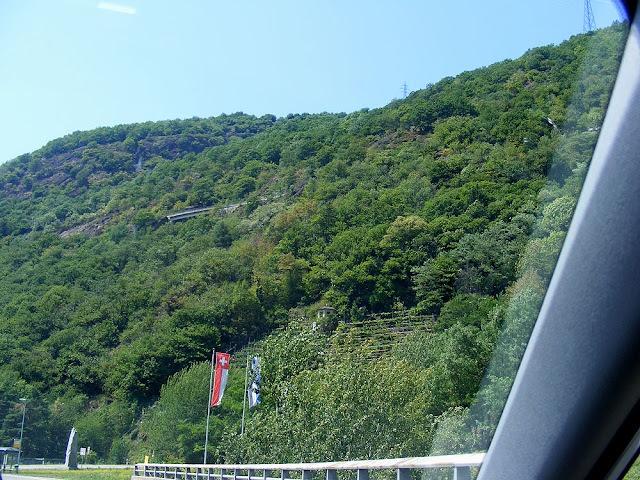 They were taken from a moving vehicle on the motorway as we sped home after a nice lunch in the village of Grono, in the Swiss Italian speaking Calanca Valley. I like them because they show the most beautiful neat and orderly little vineyard imagineable. 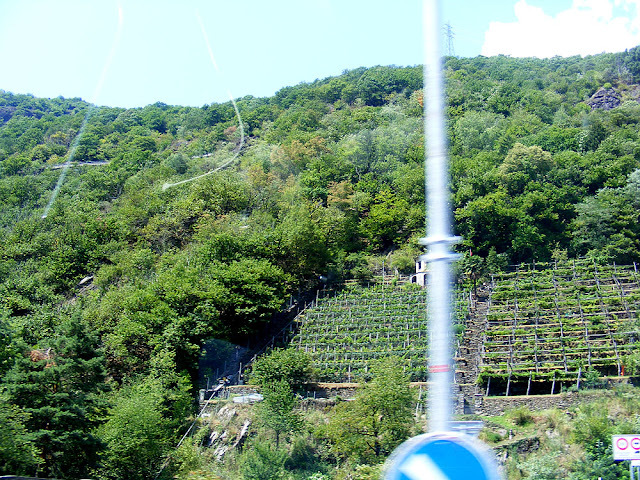 The rows are terraced because the land is extremely steep -- so much more practical that the vertical rows on hillsides one sees in many places. 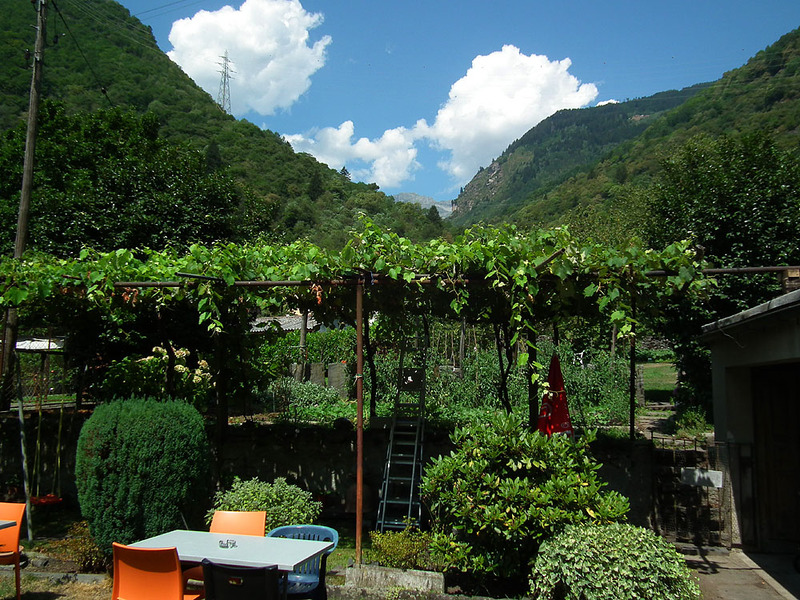 Grono, at the head of the valley, is the warmest place in Switzerland so these vines thrive. As does the palm tree in the middle of the plot. And yet above the vineyard you can see the local road, with its cloister like avalanche protection. Early December is the season of Christmas markets. Preuilly's was on Saturday 8 December, on a cold bleak day which didn't encourage people to be out and about. Nevertheless the market place was reasonably well populated with shoppers, I guess because lots of them were picking up their Christmas tree. Horse drawn fun for the kids. I had a nice surprise when I stopped at the Noiseraie Productions stall. One of the men working there was Mickael, our former plumber. We had a nice catch up and it turns out that he is now the maintenance man at the nut butter factory. 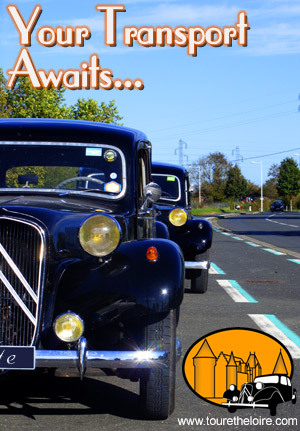 They employ nine people at Noiseraie Productions, including Mickael and his brother. Mickael services the production machinery and no doubt does lots of odd jobs. He trained as a plumber, but his father is a mason and Mickael is the sort of practical chap who can turn his hand to anything. 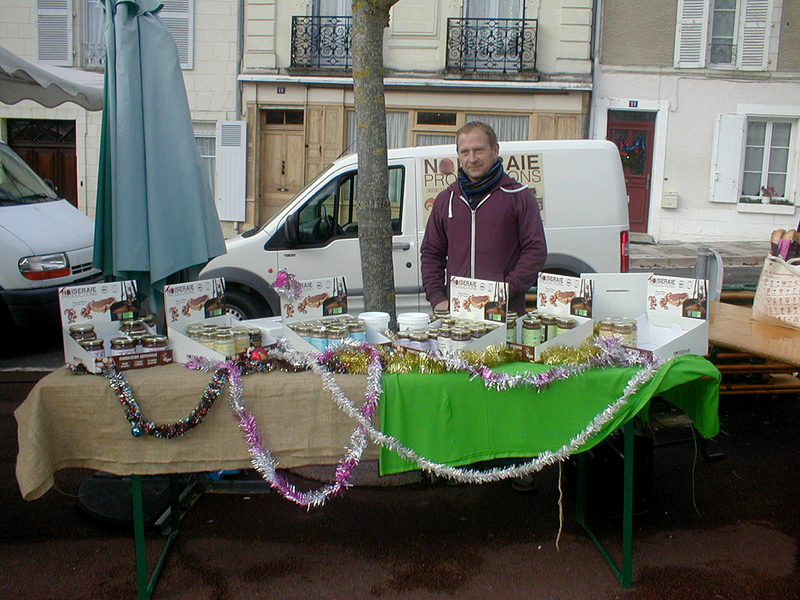 Mickael at the Noiseraie Productions stall. After the attack at Strasbourg Christmas market I feel it is worth pointing out that no one would have any hesitation about attending a small rural Christmas market. It's all about supporting your local community and local artisan stallholders. Twinkly lights in the trees. The other day I visited the dentist. My teeth, thankfully, are excellent, so I only bother to make an appointment every couple of years for a checkup and a polish. Nobody in the waiting room at 9am. 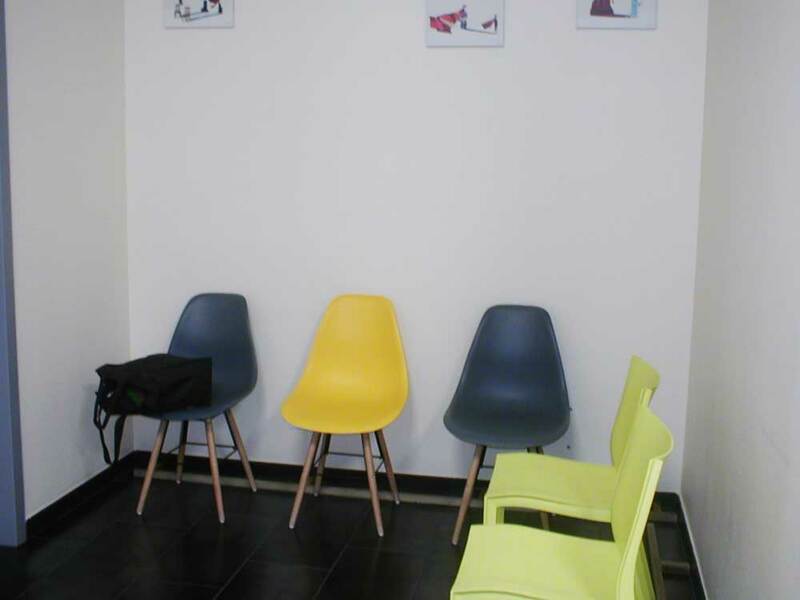 We have a new young dentist in Preuilly after our previous dentists, a married couple, retired last year. The new dentist is Dr Zaharia and he tells me that he is Romanian but has lived in France for twelve and a half years. Everyone I've mentioned him to has been very positive about his professionalism and skills, so that is good. I thought he seemed a nice guy and he certainly seemed competent and caring. 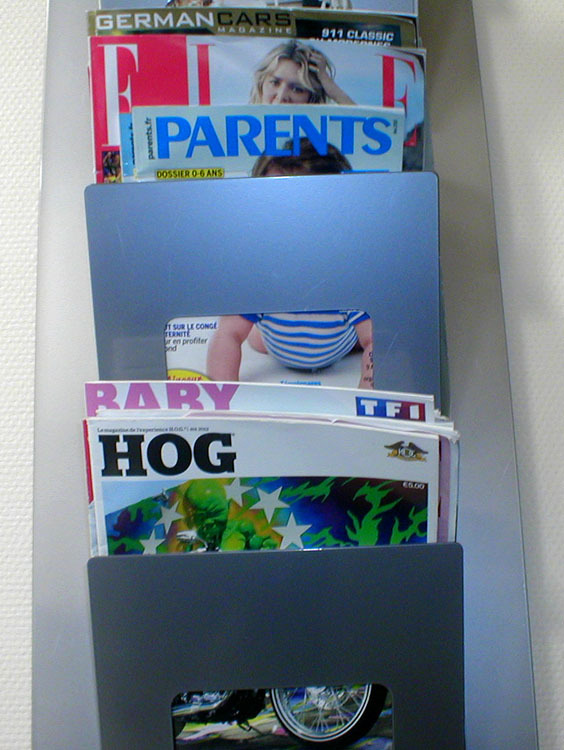 I was amused to see a memento of Dr Renaudie, a Harley enthusiast, in the magazine rack. His surgery is in the old postal sorting office, easy walking distance from our place -- something that was important to me. 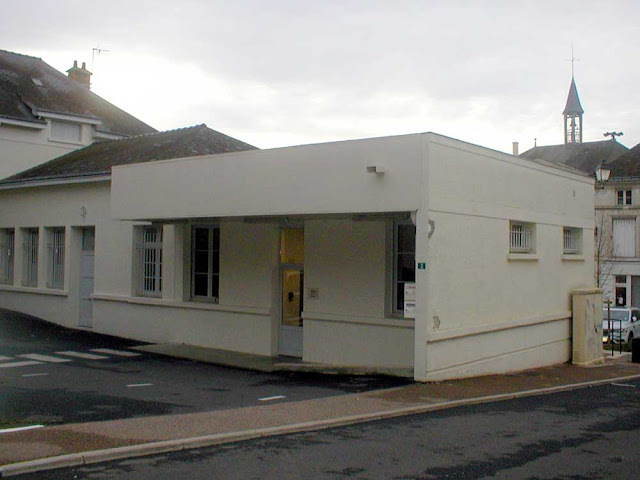 Simon goes to Dr Beye in La Roche Posay, and I could have chosen to go there too, but thought it was better to have a dentist I could walk to. 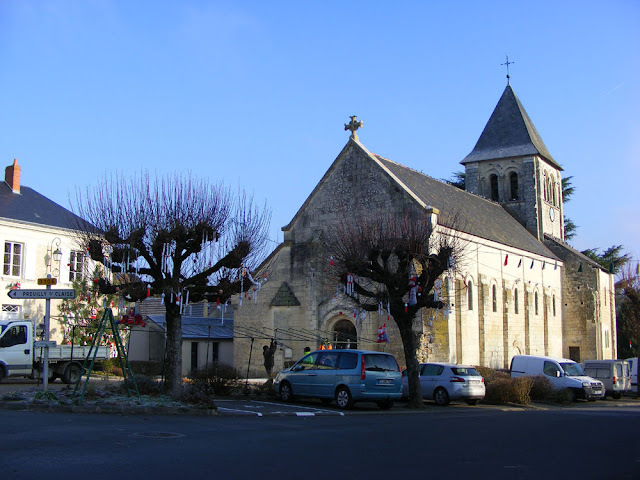 A couple of weeks ago, on a really miserable blustery wet day I drove over to Nouâtre on the Vienne to meet other members of the Association de botanie et de mycologie de Sainte Maure de Touraine. 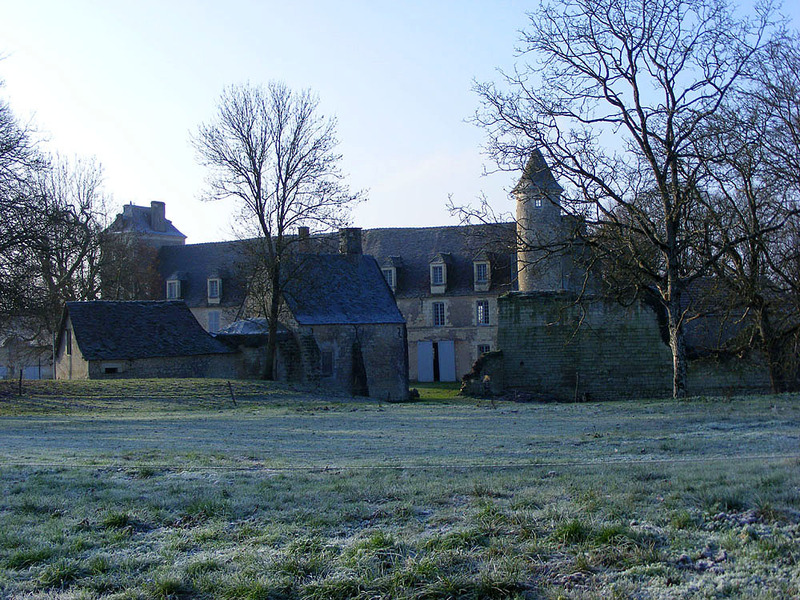 Nouâtre, in case you don't know it, is home to a ginormous army base used as a materiels repair, storage and supply hub. It used to be bigger and the part that is no longer in use by the military is an industrial estate. We were off there to visit Bio-Champi, a company producing half a dozen organically grown species of mushrooms for the pharmaceutical industry, but (not yet) for culinary purposes. 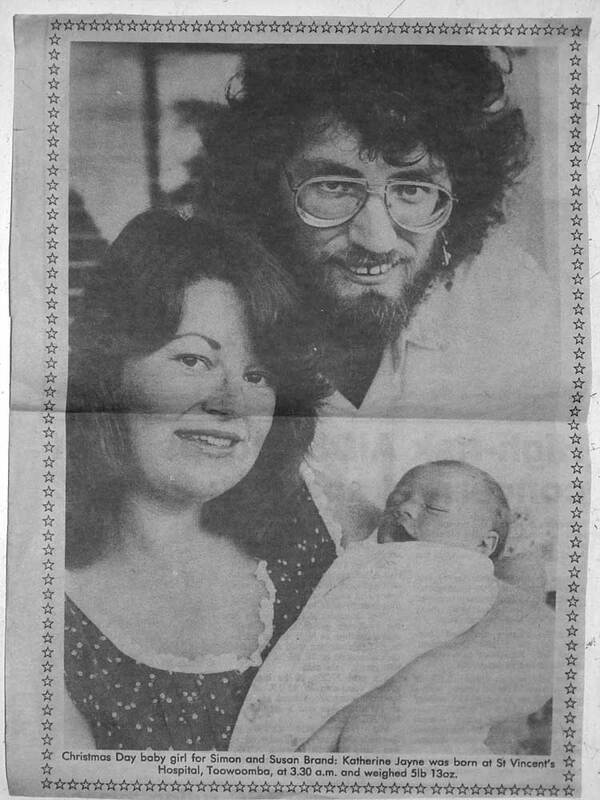 Photo courtesy of Louisette Chaslon. The business was established 15 years ago by Chinese born microbiologist Guanglai Zhang and they specialise in cultivating rare species using a Japanese technique that no one else in Europe is using. The mushrooms are grown in transparent plastic pots, which in earthquake prone Japan mean that you do not lose your crop when the ground trembles. The clear pots also mean that any contamination by diseases can be seen early. There are machines made for the various processes involved in the cultivation and designed specifically to deal with these plastic pots. The polypropylene pots are sterilised in autoclaves and can be reused 18 times, which makes them eco-friendly. growing in its special Japanese pot. The species we focused on for our visit was the White Ferula Mushroom Pleurotus eryngii var nebrodensis (Fr. Pleurote du panicaut). There are thirty species of Pleurotus (oyster mushrooms) which are grown commercially. The best known is the Grey Oyster Mushroom P. ostreatus, which you can buy in almost any supermarket these days, but the most highly prized is the White Ferula Mushroom. The variety P. e. ferulae (White Elf Mushroom) is found in the wild in France, associated with thistles, and recognisable by its slimmer stem. Another well known variety is the King Oyster Mushroom P. e. eryngii, which has a bigger slightly paler cap. Guanglai Zhang, holding a tube of mycelium. Four varieties of P. eryngii are native to Europe and one to China, all growing at different altitudes above sea level. All are edible. The rarest is P. eryngii var nebrodensis, the White Ferula Mushroom, growing in the wild only in the high rocky mountains of Sicily (1200 - 2000 m), where it is always associated with the umbellifer Cachrys ferulacea. It is also one of the top ten most highly sought after edible mushrooms in the world. Although it is Red Listed there is no protective legislation in place and it can still be harvested in the wild. Consequently, it is believed that fewer than 250 mushroom fruiting bodies per year reach maturity in the wild due to over harvesting and the picking of immature mushrooms. Bio-Champi is therefore developing and refining a method of cultivation for the species, to supply the culinary and medicinal demand and take the pressure off the wild population. They also grow the ordinary Grey Oyster Mushroom at their facility. The thick stem is diagnostic for P. eryngii var nebrodensis, and many mushrooms on the market purporting to be this species turn out to be one of the other more common varieties of P. eryngii. This species is heat and cold resistant, making a crusty cracked skin on its cap in hot weather, as the flesh grows more quickly than the skin. This cracked skin is a sign of the best quality with the most flavour. The mushrooms will appear in the wild in April-May and September-October. Showing us the outdoor mushrooms. The White Ferula Mushroom P. eryngii var nebrodensis is also associated with another umbellifer, Sea Holly Eryngium spp. In Spain the mushroom is cultivated outdoors in rows of Sea Holly but it is a lot of work and the crop is plagued by disease. The aim of the cultivation and research at Bio-Champi is to select strains with good stems. They've found there is no need to provide Sea Holly and that the mushroom is content to grow indoors on a mixture of sawdust and straw, which is full of cellulose and lignin which the mushroom will feed on. Another advantage of growing it indoors is that less water is required and it is much easier to keep everything clean and disease free. Commercial production of the White Ferula Mushroom is mainly concentrated in Asia, with one million two hundred thousand tonnes grown in China. Japan, Korea and Taiwan are also significant producers. Only one hundred tonnes are produced in the whole of Europe. Bio-Champi propagate by using secondary mycelium in test tubes, not spores. The secondary mycelium is harvested from the section between the stem and the cap of the mushroom. If you want to create hybrids you need to work with spores and create primary mycelium. It takes about ten years to produce a good mycelium. Bio-Champi, along with Greek and Italian experts, are also trying to establish why the mushroom occurs only in Sicily and why it is rare. A lot of the extant literature will say that it also occurs in China, in the province of Sin-Kiang, but this turns out to be an unfortunate misidentification. In mushroom cultivation producers have the choice of pasturising or sterilising the substrate. Pasturisation (the technique used at the mushroom caves at Bourré for example) does not kill certain microbes, but is suitable for species such as button mushrooms Agaricus bisporus. However, the White Ferula Mushroom is much more disease prone and the sterilisation process was developed to combat that. The pots and substrate are put in the steam vaporisor autoclave for 10 hours at 100C, then mechanically inoculated and closed for incubation. The sterilisation kills all bacteria and the inoculation machine can process three thousand pots in an hour. Viruses would not be killed, but are not a problem for the cultivation. The pots spend 10 months in the incubation chamber, until the mycelium and little fruiting bodies start appearing. To begin with the temperature is controlled to be within 12 to 18 C but once fruiting starts this is not so crucial. At this point they will be transferred to another shed if it is summertime, but in the winter they are simply put on wheeled racks and trundled outside to grow naturally. Neither rain nor frost damages them, but in the summer parasitic flies are a very big problem. They are also keeping a close eye on new developments in China, where they are cultivating new species such as Summer Cep Boletus reticulatus, the morel Morchella vulgaris and Chinese Truffle Tuber indicum. More photos by Louisette on her blog. Photos by André on his blog.